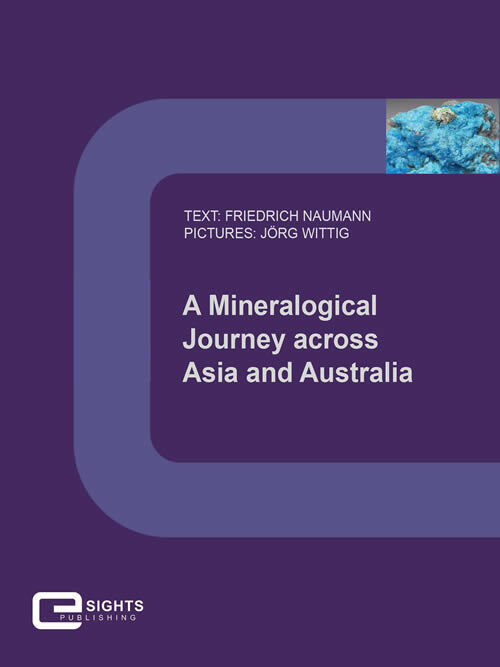 Friedrich Naumann, Jörg Wittig: A mineralogical Journey across Asia and Australia.E -Book from E-Sights Publishing Chemnitz. 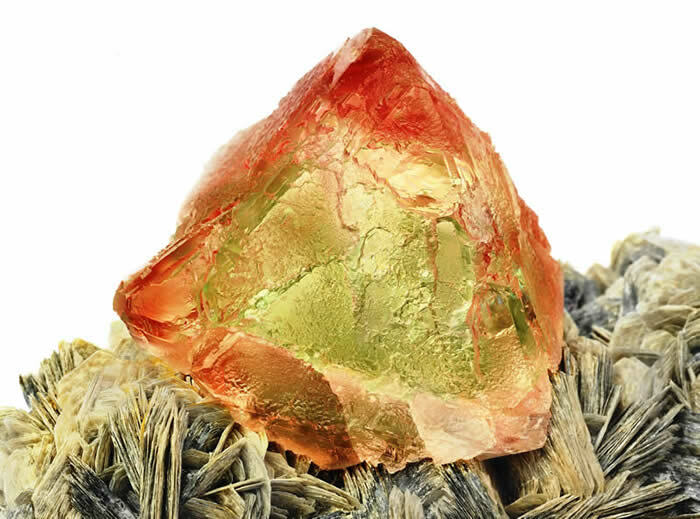 Nobody can escape the fascination of the mineral world, because each mineral is a unique specimen and evokes admiration due to its form, colour, shape and distinct features. Worldwide, more than 4600 different minerals were identified. Since 2008, the most beautiful of them have found their permanent home in TERRA MINERALIA in the university town of Freiberg. In 90 selected steps this e-book leads the mineralogical journey that began in Europe to Asia and Australia. The Pakistani Hunzatal, which is situated in the 7,000 metres high Carakorum Mountains, became famous as ‘valley of (the) old people’ – an isolated oasis of health and there are no sick persons but huge rock formations that provide extraordinary findings here and there. However, such big and beautiful fluorites, as shown in this picture, occur rarely. The interesting zonary colouring – green and orange-red – was probably caused by a multistage growth that took place on delicate and leaf-shaped muscovite (mica). Here, there is, apart from malachite, the (copper) mineral azurite in the copper mine of Shilu. This mineral was already popular regarding jewellery or pigment in antiquity and later in China and Japan as well. 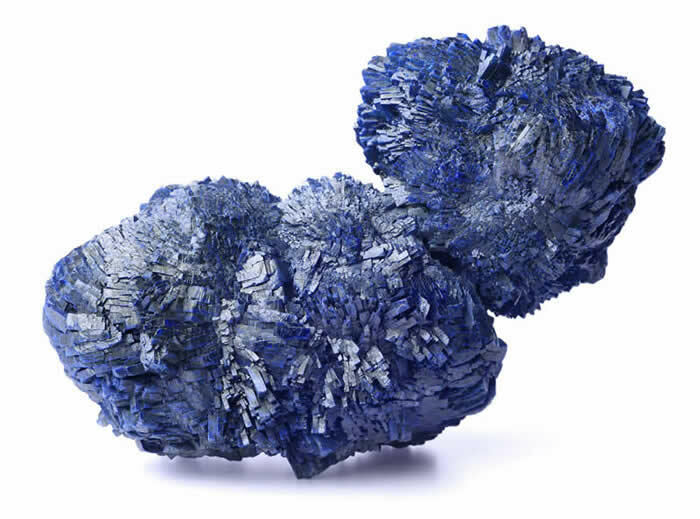 Azurite has various names like ‘mountain blue’ (Bergblau), chessylite (named after the French place Chessy near Lyon) or copper glaze, which is due to its intense blue colour, decorated in elaborate handwritings of Middle Ages. Rosette-like formations, as in this case, occur rather rarely, whereas prismatic and platy crystals are crowded, evoking interesting optical effects. Pure aesthetics! Such a harmony of colours and shapes is just fascinating. However, delicate snowballs of okenite, which is a relatively complex calcium silicate, are associated with perfect amethyst crystals. In addition, okenite appears as fine fibrous as well as radial fibrous aggregates, as shown in this picture. This mineral was named after the German naturalist Lorenz Ocken. The transition area of the surrounding volcanic rock of the geode (amygdale) shows an increasingly fine and amorphous crystal structure – similar to chalcedony. 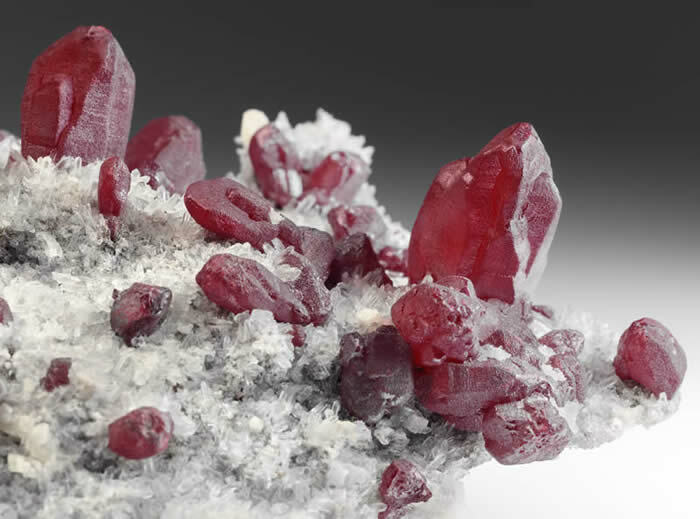 Cinnabar (Latin: cinnabaris, dragon’s blood), which is also called ‘red mercuric sulfide’, is the most important mercury/quicksilver mineral, containing 86.2 % of metal. In addition, this mineral was a popular dye stuff in antiquity since cinnabar is resistant to water and beautifully red-coloured. Later, this mineral, which is produced by reduction, was a basis for high - quality mirrors and was used in specific remedies and chemical agents as well. 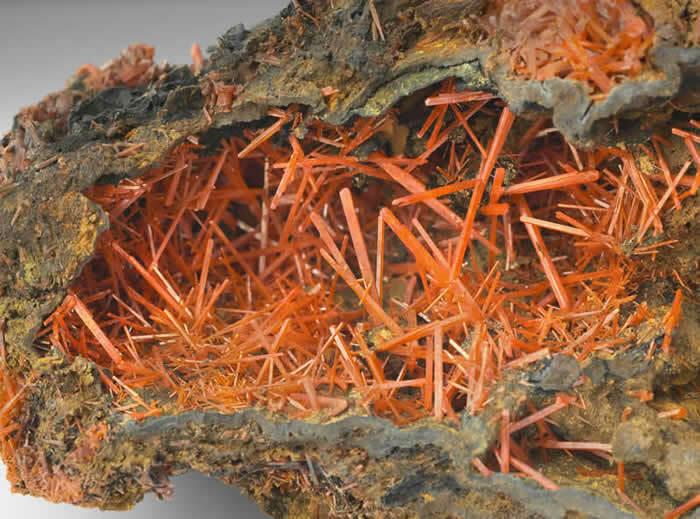 The specimen in this picture, where cinnabar crystals grew on quartz and dolomite, stems from (the) mine Yanwupin, which has been closed down, in the region of Guizhou in the south of China. This specimen is fascinating because of its crystal's excellent order. 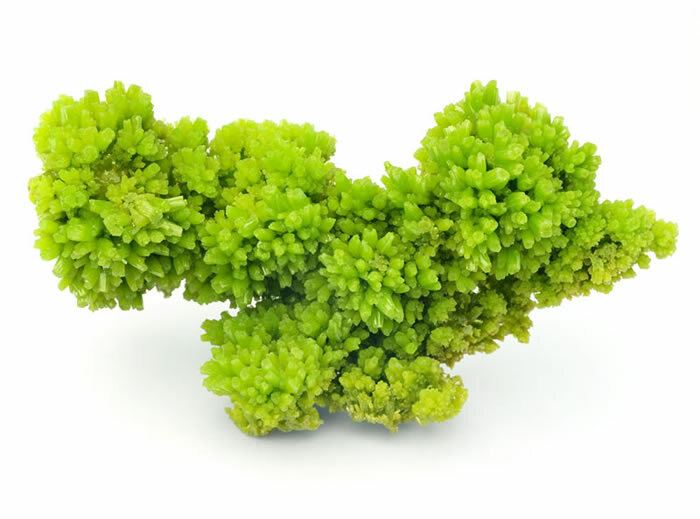 The crystal shines beautifully green and that occurs rarely but is typical for pyromorphite. However, crystals are not perfectly developed here neither since prismatic surfaces are crooked, partly furrowed and surfaces are formed imperfectly. There are many reasons for such defects – disorders in (the) atomic structure or defects in construction but also dissolutions, cauterisation and so on. Crocoite is a lead-chromium-oxygen compound whose eye-catching colour is comparable with dried saffron. ‘Crocoite’ is derived from the Greek term crocus (= saffron). However, people used to call this mineral Rotbleierz. 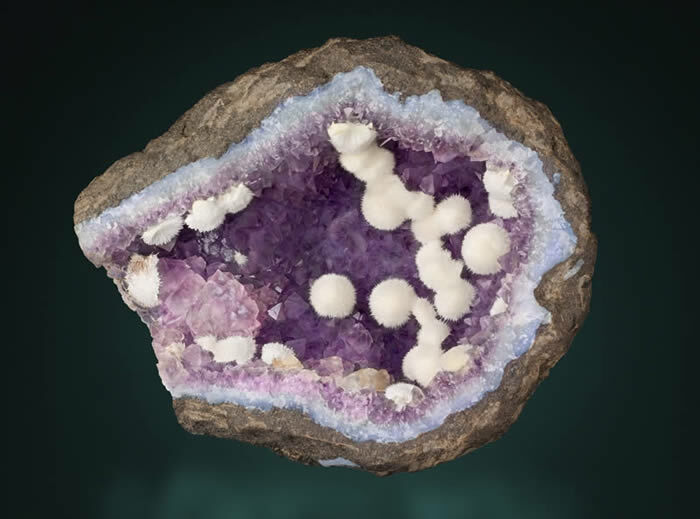 The development of this adorable mineral is due to an addition of oxygenated solutions. In this picture, crocoite is surrounded by a yellow-brown iron ore matrix (= limonite). In addition, this ore deposit is situated in a slight depth. The Tasmanian Adelaide Mine is one of the most spectacular finding places in the world. Since 1960, this mine has been used for specimen mining only.